Something Ive been wondering regarding the WoD changes for hit. Removing miss rates from most abilities and giving them a variable damage range instead. On live Crush does 28 damage base with 80% hit. And Meteor Strike has 80% chance to hit and dealing 35 damage base. Crush now deals 14-26 damage base with 100% hit. With Meteor Strike doing 24-35 damage base with likewise 100% chance to hit. So what Im wondering, is that if a pet mainly relies on variable damage, if its thusly not encouraging a H/H breed for added longevity as you gain less from power due to lower average damage? Even if you hit far more often compared to live? Though as it seems to me, with many abilities having a lower damage output, it would make sandstorm stronger as a defensive ability. But on the other hand, an Anubisath will have harder to punch through the damage reduction because of a weaker crush. Complaints will change from "ability x missed y times, no way it has z% hit rate" and "I am tired to losing to random misses." to "ability x hit for low damage y times, no way it can hit for high damage." and "I am tired to losing by doing low damage when it could have been high.". Perhaps just slightly less often since you actually do some damage instead of none. Not sure this change will favour another breed. P/P will certainly still hit harder, so their lower damage will be higher. Im sure Blizz will have to change shield/sandstorm values a bit as well to reflect the changes. Of course they would still need to be able to stop DoTs. Vek wrote: Complaints will change from "ability x missed y times, no way it has z% hit rate" and "I am tired to losing to random misses." to "ability x hit for low damage y times, no way it can hit for high damage." and "I am tired to losing by doing low damage when it could have been high.". Well said, many people just doesnt understand random chance and tending to be wrongly focused on streaks of bad luck. Randomness and streaks of bad luck I could understand if not for the fact I always seem to have the bad luck. I have over 3k pvp wins and have leveled every pet I have to max so I have done quite a bit of pet battling. I even got the addon to track my move hit chance and guess what? Ever move by all my pets miss 5 % up to 10% lower than the move says it should miss. Every move and this is with over a thousand times using said moves. So I say their hit chance on moves is way off and has cost me countless matches. I like the new hit 100% hit chance with just lower damage chances. I have lost to many times to count where I needed one hit to win and proceeded to miss 5 to 6 times in a row to end up losing said match. Blizz and math seem not to work so well. Guess they will have to change nimbus and rain dance a bit? Rain dance they probably won't cause of the +heal and +crit, but nimbus was listed among abilities where "extras" were being added. Basically all the abilities that were just +hit should get some extra stuff. So it will be entirely case-by-case, based on the numbers they choose. Clearly a nerf to his offense and a buff to his defense. Overall it's a small nerf, but if other pets are also having their damage lowered, he's likely to be stronger than he is now (in relation to other pets). On an interesting note. Xu'Fu's Spirit Claws will retain their base 28 damage and 80% chance to hit, and going up to 100% under moonlight. But I still cant see anyone using Moonlight over Feed on Xufu, and having it bought by another pet instead. Feed is just too good. Especially as Feed gets buffed, from 90% hit on live, to 100% in WoD, and retaining its base 20 damage. @poofa: but why use crush on the anubis when demo is now 100% hit? Drudatz wrote: @poofa: but why use crush on the anubis when demo is now 100% hit? Demolish retains its 50% hit chance. Pretty much all abilities with 50% hitchance is untouched. The low-accuracy attacks previously gave you a small advantage to overall damage, in exchange for the higher risk of missing. Ie Crush was 22.4 average damage; Punch was 20. That is no longer the case. 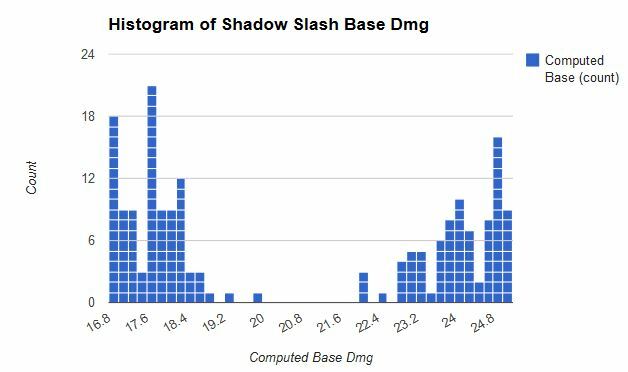 There is effectively no incentive to use the high-damage-range attacks, because their damage is the same overall, and there is very little to gain by gambling on the higher damage range. Now suppose we have pets with 100 health. Obviously with Punch (100% accuracy, 20 dmg), I will always win in exactly 5 turns. These are really good odds: I have more than a 50% chance to win a turn faster than Punch; 83% chance to at least break even; and only 17% chance to come out worse than Punch. Ie, the risk is well worth the reward for these abilities (in fact, it was probably too good). So the high-damage-range abilities are now completely worse than the high-accuracy abilities. There's no upside to the gamble any more. If Punch always wins in 5 turns, why would I ever choose Shadow Shock if the only upside is a 0.05% chance to win in 4 turns, versus a 50% chance to need 6 turns? The new version of these abilities has less randomness, but also less damage overall -- so even though there's less randomness, the randomness can only hurt you, and hardly ever help. Love you Poofah, very interesting post. This feels like a good compromise over the old versions, while still keeping some bonus damage as a reward for choosing more randomness. (old versions were -- Punch (20 avg), Claw (0.9*24 = 21.6 avg), Crush (0.8*28 = 22.4 avg) ). Yes, that is odd. The min/max values make sense, but the variance is way too high for a normal or uniform distribution. And given that the min/max are what we expect, then a normal or uniform distribution would be centered around 21/22. So it can't be as simple as that. It's almost as if they took a normal distribution, centered around 20 and with a large variance, but then put cutoffs at 16.8/25.2 (or 15.4/28.6). If you have the data in a convenient form then maybe you could plot a frequency distribution (damage on X axis, frequency on Y). Those sample sizes are big enough that you might spot a meaningful trend. 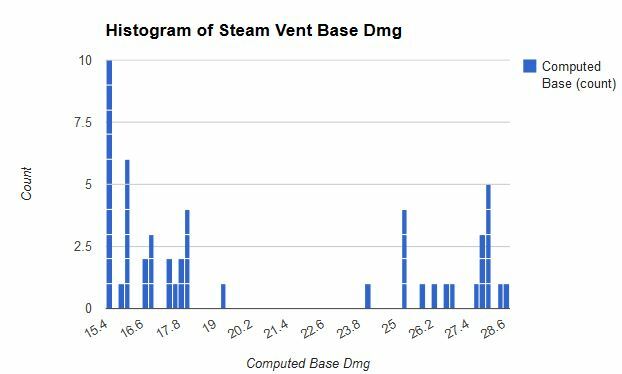 Alternatively you could sort the damage values by size, then plot the 188 values as a column chart. I'm guessing there might be a lot of values piling up at the extremes (ie a lot of 16.8s). EDIT: I changed the bucket size to 0.2 (figuring base damage varies in increments of 0.1) which definitely helps the display. You can see from the bi-modal shape of the distribution where the high variance comes from. Yep, bizarre. There's a couple possibilities. Maybe the game flips a coin, then gives you either a high hit (~24 +/- SD) or a low hit (~18 +/- SD). So maybe it's a 'low' normal distribution and a 'high' normal distribution. Another possibility is that it's the inverse of a normal distribution, in which case the frequency would trend upward as you approach the upper and lower bounds. Either way, there's clearly a hard limit on the max/min damage, which might be changing the mean of the distribution. The averages clearly aren't right. I have no idea how this is implemented, but the intent seems pretty clear -- it's a lot closer to the original hit/miss mechanic, but this time it's 'roll high'/'roll low'. If it were a normal or uniform distribution, it would be incredibly unlikely to 'get lucky' 3 or 4 times in a row. But if the distribution enforces the extremes, then it's actually pretty easy. Ie it's a 0.5^3 = 12.5% chance to roll high 3x in a row. That makes the payoff (and the downside) for gambling a lot more meaningful. Yeah, that kinda makes sense. Having it be a normal distribution really wouldn't make it feel riskier for the chance at higher damage as you'd very rarely get several high hits in a row or several low hits in a row. It would be more like crits where you got an occasional bonus, or occasional really bad hit. I haven't gathered any stats but off hand that matches what I've seen with these high damage range moves. Most hits seem to be either really big or really small not in the middle.